The National Clean Energy Fund (NCEF), one of the flagship programmes of UPA-II, failed to reach its beneficiaries, as the amount from it is now diverted to environment projects, the major one being cleaning and developing inland waterways on the river Ganga. NCEF, which totals up to Rs 14,000 crore currently, is collected through cess on coal purchase and import. The cess amount was increased to Rs 100 a tonne from Rs 50 a tonne in the National Democratic Alliance (NDA)'s maiden Union Budget, last week. "This would increase the annual collection to Rs 6,000 crore from the last year's Rs 3,500 crore. 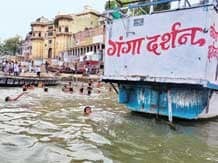 But a major amount from it would now go to the Ganga cleaning project, as per the Budget statement," said a senior official at the ministry of new and renewable energy. About Rs 1,500 crore from the NCEF has been diverted for the Ganga cleaning project. Ministry of new and renewable energy (MNRE) officials said in the past three years of its existence, projects totalling Rs 12,000 crore were sanctioned to be funded through the money collected in NCEF but the ministry hasn't received partial amount, in bits and parts. "There is a payment backlog of more than Rs 10,000 crore for clean energy projects. In spite of allocating money to these projects, which are still awaiting disbursement, a part of the ministry's budget was funded through NCEF. In technical terms, it's wastage of a cess pool set up for development of clean energy projects in the country," said the official quoted above. Among the beneficiaries are 750 Mw solar power projects tendered under the National Solar Mission in January this year, 1,000 Mw of solar power projects to come up in defence-owned areas, subsidy for off-grid solar applications totalling Rs 1,500 crore and soft loans by Indian Renewable Energy Development Agency Ltd (IREDA) to clean energy projects. The heavy weight projects depending on NCEF for their funding are Rs 40,000-crore Green Energy Corridor project and to be launched National Wind Energy Mission, which will entail a total expenditure of Rs 18,000 crore. "With the government announcing in the Budget that the money collected as coal cess would also be used for financing and promoting clean environment initiatives and funding research in the area of clean environment, there is a big question mark on how much amount would be used to fund renewable energy projects," said a senior MNRE official. MNRE officials said apart from the budgetary support, the ministry would require an additional Rs 2,000 crore from the NCEF to fund the shortlisted projects under this fund. The NCEF was announced in the Union Budget of 2010-11 for promoting clean energy in the country. Due to lack of inter-ministerial coordination over identifying the correct beneficiaries, projects worth Rs 10,000 crore are stalled for want of allocation of funds from the NCEF, the ministry officials said.